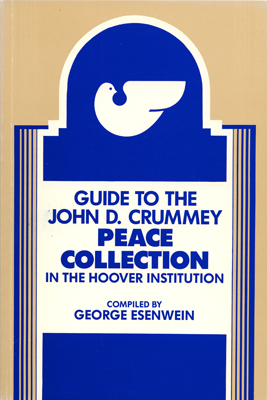 In 1977, the Food Machinery Corporation (FMC) established the John D. Crummey Peace Collection at the Hoover Institution Library & Archives in honor of its founder, John Crummey. Today this fund is one of more than twenty endowments that help preserve and make accessible collections in the Library & Archives. Crummey’s family has been associated with Stanford University and the Santa Clara Valley since the nineteenth century. His grandfather John Bean founded the Bean Spray Pump Company in Los Gatos, California, in 1883. Bean, a Maine native, had purchased a ten-acre almond ranch and developed a sprayer to protect his crops from disease. Bean’s sprayer, which he then patented, became the basis for his pioneering agricultural company. Eventually Bean’s grandson John, who entered Stanford University in 1899, took over the company and renamed it the Food Machinery Corporation (FMC). Crummey and his associates helped build FMC into what is today one of the world’s most successful chemical companies. After Crummey died in 1976 at the age of ninety-eight, FMC endowed the John D. Crummey Peace Collection to honor him as a longtime friend and admirer of Herbert Hoover. The collection contains an array of archival materials on peace, disarmament, and pacifism, including the papers of Nobel Peace Prize winner Alfred Fried, the records of the American Friends Service Committee, and delegation propaganda from the Paris Peace Conference in 1919, among many others.